How can I drive more visitors to my website? Let MICOS GROUP TRAFFIC GENERATOR do it for you! Online marketing can be time consuming—let MICOS GROUP TRAFFIC GENERATOR drive targeted, qualified users to your website and free you up to run your business. If your goal is to generate enough traffic and leads that result in sales and profits, then our National Traffic Generator specialist will guide you towards the most effective online ad campaign. Our marketing campaign has proven to substantially increase results in less time, for less money, than traditional "offline" marketing efforts. Let our specialists assess your website and create market tailored keywords & text ads specifically targeted to your customer base. When a potential customer searches specific keywords relevant to your business, they see your ads in the "sponsored search results" section of the search results. 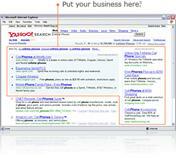 Your ads will appear on major search engines such as Google, Yahoo, AOL and more. · A Marketing Consultant will work with you to develop a customized online ad campaign based on your targeted audience. · A comprehensive keyword portfolio designed to target your customers geographically, demographically and behaviorally based on your marketing objectives. · Compelling advertisements placed on top search engines, such as Google and Yahoo!, to maximize click-through conversion and drive qualified traffic to your website. · Weekly performance reports and ongoing campaign optimization by your dedicated Marketing Consultant. If your goal is to generate enough traffic and leads that result in sales and profits, then our Local Traffic Generator specialist will guide you towards the most effective online ad campaign. Our marketing campaign has proven to substantially increase results in less time, for less money, than traditional "offline" marketing efforts. · Compelling advertisements placed on top search engines, such as Google Local and Yahoo! Local, to maximize click-through conversion and drive qualified traffic to your website. · Low $15 monthly spend level.